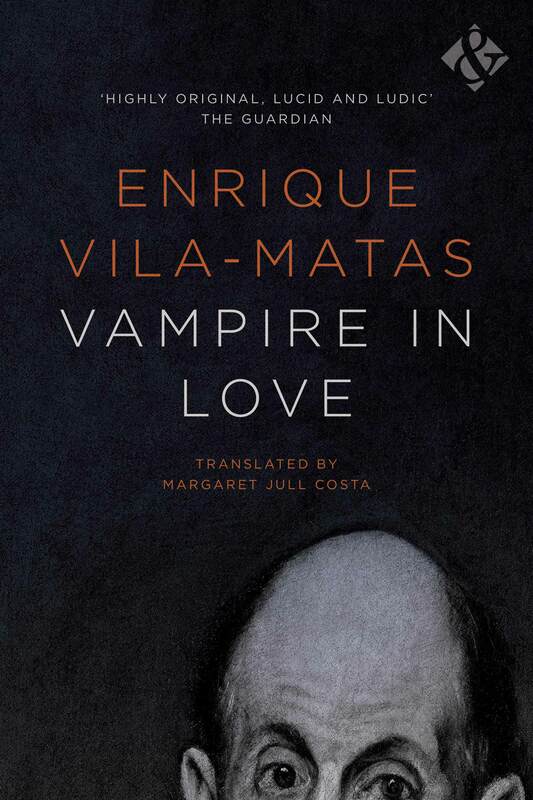 Vampire in Love is curious in that it has not only been translated by, but also curated by, Margaret Jull Costa: it does not exist in its original language, but comprises short stories selected to translate into English for the first time. A man hides from his wife because she thought him ugly; he has plastic surgery and voice coaching to change him beyond recognition, and proceeds to spy on her. A once stick-thin actor puts on weight and stops getting parts; his agent sends him to find a – very thin – partner with whom he can form an “electrifying double act”. An old man dreads his son surviving an operation, as he’s come to the realisation that his son is a complete fraud. These are the stories of Enrique Vila-Matas, as selected and translated by Margaret Jull Costa – renowned for her impressive body of translations from Spanish and Portuguese, including the work of Javier Marías, José Saramago, Eça de Queiroz, António Lobo Antunes, and Paulo Coelho, among many others. I loved these stories for not always being stories, but moments, anecdotes, observations – told, but often not concluded, at least not conventionally. Truth be told, I loved them as a writer, or aspiring writer: for the way they inspire me to live and to write in a certain way – constantly collecting material, listening to everything (in particular, in the story called ‘Modesty’, discussed below). They had a similar effect on me as Patti Smith’s memoir Just Kids in the way the writing made me think – I want to live like my life in the way this person does… I want to be this writer. The collection spans Vila-Matas’ whole writing career. The stories have been handpicked by Jull-Costa from Vila-Matas’ previously untranslated anthologies and stories published in newspapers over the years. They reflect common themes that intersect his oeuvre – father/son relationships, and suicide and the incessantly recalled “abyss” – and the breadth of his range of voices – from the amphetamine-addled wannabe writer in ‘Sea Swell’ to the mother whose mute son reveals his seemingly innate and pure fascism on the day of Franco’s funeral (‘Greetings from Dante’). They are often, though not always, written in the first person. And this first person gently swings in the degree to which she or he appears to resemble the inner-dialogue of the author. A crucial difference between this book and Patti Smith’s, to which I have doubtless incongruously compared it, is that the latter is presented as (a version of) “what happened”, whereas Vila-Matas keeps us guessing, until the end and beyond, at the extent to which these stories are autobiographical. Surely he wouldn’t write that if it were true… would he? Of course, we’re not meant to ask these questions: everything is true, and nothing is true in literature. But I couldn’t help it. I wrote to Margaret Jull Costa – to ask her what she thought about this, and about how she had gone about selecting the stories. How did you select which stories to include in this collection? I wanted the collection to cover all of Enrique’s writing up until now, so I tried to choose one or two stories from each collection, but I was also just choosing my favourites too, of course. I drew up a list and sent this to Enrique, and he added or subtracted one or two [He added ‘An Idle Soul’ – which Jull Costa describes further down – ‘They Say I Should Say Who I Am’ – in which a boatswain’s mate confronts the “great Panizo de Valle” for having earned a fortune painting the portraits of the natives of the Babákua peninsula without ever having set foot there – ‘I Never Go to the Movies’ – in which a man attends a party and is mistaken for a “distinguished movie director” – ‘Vok’s Successors’, in which he as the writer is followed by a man who offers to ghost-write his work, which he, in turn, is writing on behalf of ‘Vilém Vok’ – and a series published in El País as Semi-ficciones, from which Jull Costa chose ‘I’m Not Going to Read Any More Emails’, discussed below]. How was this process for you – I imagine it must have been an enjoyable one? It was hard having to discount so many stories, but it was fascinating to read the whole arc of his story-telling life so far. Something that comes across in your translation is that Enrique Vila-Matas does not have one voice or style, but many, and that these voices and styles vary greatly between stories, which may have something to do with the fact that he wrote them at different points in his life. I refer to the story ‘I’m Not Going to Read Any More Emails’ for his view on writing styles: “…only a fool would deny that there are as many forms of literature as there are forms of life”. Did the translation of his different voices and varying style pose any challenges? I think it may have to do with the fact that the stories chosen span most of Vila-Matas’ writing life, but I think he is very actorly in his taking on of different characters and voices. I really like that in a writer, and I don’t know that I find it a problem as a translator. My job is to be sensitive to that voice and reproduce it in English. How do you describe/summarise this short story collection? To steal someone else’s title, it would be “Tales of the Unexpected”. None of the stories take you along an expected route and none of the characters behave as you might expect them to. The “meaning” of many of these stories is opaque: did meanings become clearer to you through translating the stories? Are there any whose meaning remains a mystery to you? I’m not sure the stories are meant to have a meaning, but, rather, to evoke a particular situation or atmosphere. The stories that had the greatest impact on me were ‘The Boy on the Swing’ [a haunting father/son tale], for its poignancy, and ‘Modesty’, because I loved what it conveyed about the way in which Vila-Matas observes people to get material for his stories. Did you have a particular response to these stories? Which story had the greatest effect on you? Do you enjoy translating a collection of stories as much as you do a novel? I love short stories anyway, and there is something very satisfying about translating a short text. It’s so much more graspable than a whole novel. It feels, doubtless erroneously, easier to perfect each little nugget of fiction. With this collection Jull Costa presents Enrique Vila-Matas as the exceptional storyteller he is. These may not all be stories in a traditional sense, but they are all compelling and haunting – even more so for their tendency towards a lack of structure and form, and their flirtation between fact and fiction.